Obituary – Johndrow, Vada Marie (Sloan) « Perry High School Alumni Association, Inc.
﻿National Junior Honor Society 46-47, Y—Teens 47-48, F.T.A. 48-49, F.T.A. Secretary 49-50, Junior Play 48-49, D. E. Club 48-50, Student Council 49-50. ﻿Vada Marie (Sloan) Postelwait Johndrow, 85, slipped peacefully away surrounded by her family on Wednesday, November 9, 2016, at her home in Winfield. According to Vada’s wishes, cremation has taken place and inurement will be at Mt. Carmel Cemetery in Perry, Oklahoma at a later date. Memorial contributions can be made to the Cowley County Humane Society, contributions can be left in care of the Shelley Family Funeral Home of Winfield. Vada was born on July 10, 1931, in Ness City, Kansas, to loving parents William and Marie (Mellis) Sloan. She graduated from Perry, Oklahoma high school and later received an associate’s degree in accounting from Cowley College. 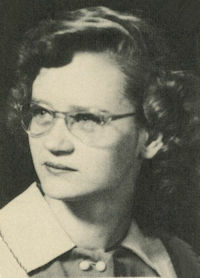 Vada enjoyed working at the South Central Kansas Medical Center for many years. Vada began there in 1972 as a relief switchboard operator and rose to chief financial officer retiring in 1993. Vada was united in marriage on March 23, 1950, with John W. Postelwait and they had four children. John preceded her in death on October 3, 1981. She was later united in marriage with Robert Johndrow on January 8, 1983 in Arkansas City, Kansas. Vada loved her family and spending quality time with them. She enjoyed fishing with a cane pole, raising cattle with her husband Robert, reading a good book, sitting on the deck watching sunsets and solving word search puzzles. She also loved her puppy dogs, especially Princess and Gizmo, who both lived to the age of 19. Vada was a member of the Order of the Eastern star and the Central Christian Church of Arkansas City. Surviving to honor her in memory is her husband Robert; children: John Postelwait and wife Linda, Mark Postelwait and wife Carlie, Dale Postelwait and wife Sandra, daughter Carla Courtland and husband Robert; step-children: Sandra Dubach and husband Ronnie, Margaret Burlingame and husband Bill, Sharon Neighbors and husband Kevin, Becky Groene and husband Kirk, Mark Johndrow and wife Rhonda; her brothers: William Sloan of California, Raymond Sloan of North Carolina and Leo Sloan of Perry, Oklahoma; sisters: Joyce Milliron of Erie, Kansas and Vivian Gibson of Halstead, Kansas; as well as 22 grandchildren and numerous great-grandchildren and nieces and nephews. She was preceded in death by her parents, her first husband and her step-son Jim Johndrow.